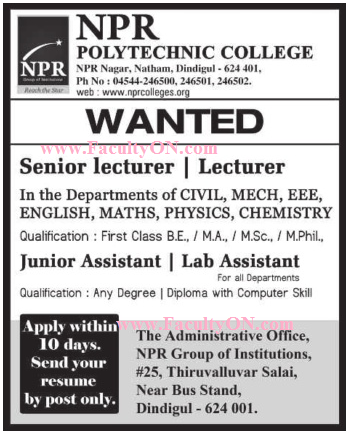 NPR Polytechnic College, Dindigul has advertised in the DINAMALAR newspaper for recruitment of Sr.Lecturers / Lecturers Plus Non-Faculty jobs vacancies. Interested and eligible job aspirants are requested to apply within 10 days from 08th April 2018. Check out further more details below. About College: The N.P.R. Polytechnic College was started in the year 2007. It is located in a subdued area at Uluppakudi village, Dindigul - Natham Main Road. An area of 65 acres has been exclusively infrastructured for the NPR group of institutions. The lesser privileged sections of the society are absorbed by our college and tremendous efforts are made to provide opportunities and to enhance their skills.